One of the easiest ways to completely transform the look of a vehicle is by adding a vinyl wrap. The adhesive vinyl doesn’t damage paint and can be completely reversed, but also gives the vehicle a totally new look. The vinyl wrapping specialists at Fostla know a thing or two about these transformations, and gave this E92 BMW M3 a stunning look with a custom-designed vinyl wrap. The V-8 powered German coupe was the perfect candidate for a new Fostla vinyl wrap with its curvy lines and athletic stance. The Fostla team designed a full black chrome wrap with two prominent black stripes that run along each side of the sports car. Adding to the black chrome styling are tinted headlights, taillights, and windows. Further enhancing the overall look of the Fostla Black Chrome wrap on the BMW M3 are new Carbonfiber Dynamics parts that also cut down on weight. A new carbon fiber hood, front lip, side skirt edging, and rear spoiler lip all work together to generate downforce and improve airflow. The visual upgrades continue beneath each of the Black Chrome fenders. New Breyton GTS 20-inch wheels work with new spacers and a lowered suspension to create the perfect stance that matches the color of the new Fostla wrap. In the performance department, the 4.0-liter V-8 engine gains a new sport exhaust system with black Carbonfiber Dynamics quad tailpipes for an even more impressive sound. All of the featured upgrades from Fostla shown on this E92 BMW M3 can be purchased as an entire package for 14,000 euros. Of course, customers can create their own upgrade package tailored for their vehicle as well. 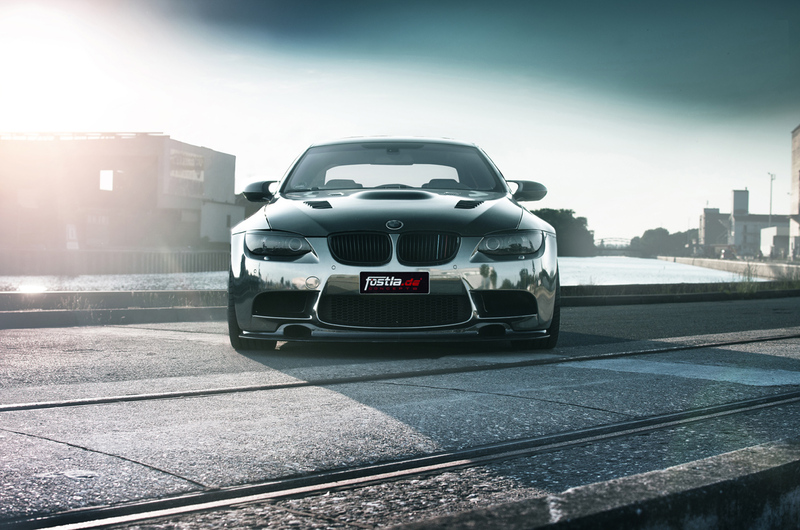 Do you like the new Black Chrome wrap on this Fostla E92 BMW M3? Get behind the wheel of an F12tdf at Spa-Francorchamps!